One must be on top of their game to be a Master Judge. 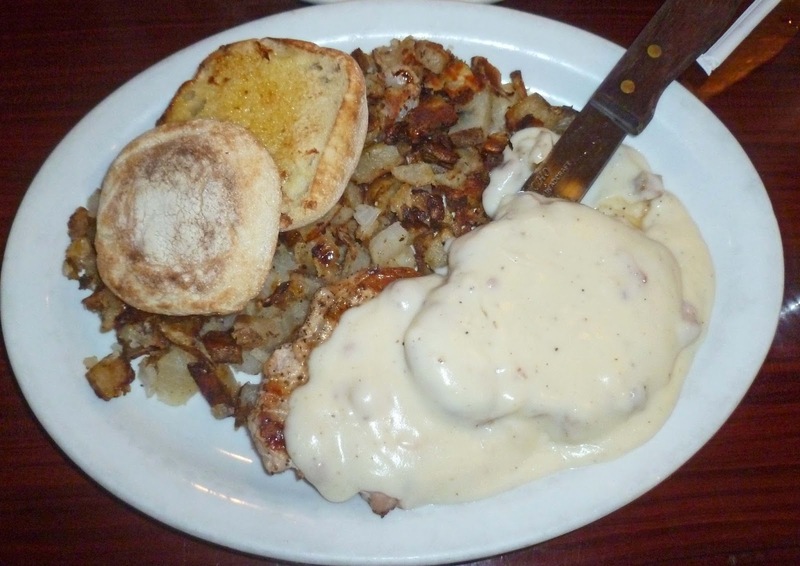 I like to start my day with a good dose of protein smothered in gravy. 'Cafe Soleil' in El Sobrante was the fueling station of choice today. This dish was advertised as 'Pork Chops with homemade Country Gravy". An old fried Dr. Biggles made an observation that these were not really chops but slices of loin. There origin was a little difficult to determine because of the thick layer of gravy. They were boneless and it was a loin cut. These slices of protein were cooked to perfection; tender and juicy. If this plate was not enough I ordered a side order of bisquits and gravy. The bisquit was flaky and soft. The 'Country Gravy' could of used some more seasoning but was just what the doctor ordered, not. I am now ready to judge at the 'Rubstock' event today. 3550 Sp. O San Pablo Dam Rd. Am really glad to hear they cooked it well! I used to go for dinner now and again, poor little loin slice was cooked until it was concave. Breakfast cooks rule! I would be ready for a long nap after eating all that, but you are made of stronger stuff. Same here Zoomie. I don't know how he judges after that gut bomb. I'd be in a food coma. meathenge, Its all about the gravy mang. The gravy was weak. Zoomie, You can always order and or consume what you can handle. I thought you liked long naps. Three Dogs BBQ, this was a training meal days before the contest. I would of not ordered the side of bisquits and gravy the day of the contest. greatwhite hunter. I know you will not have any problem in the midwest. The question is: Is the midwest ready for the "Great White Hunter"? 'The Original Red Onion' in Pinole would be a better training venue. I like their deep fried pork chops and gravy better. Wow, you actually eat breakfast before judging a contest? I never do or I wouldn't make it through brisket. I'm a bit of a light eater.